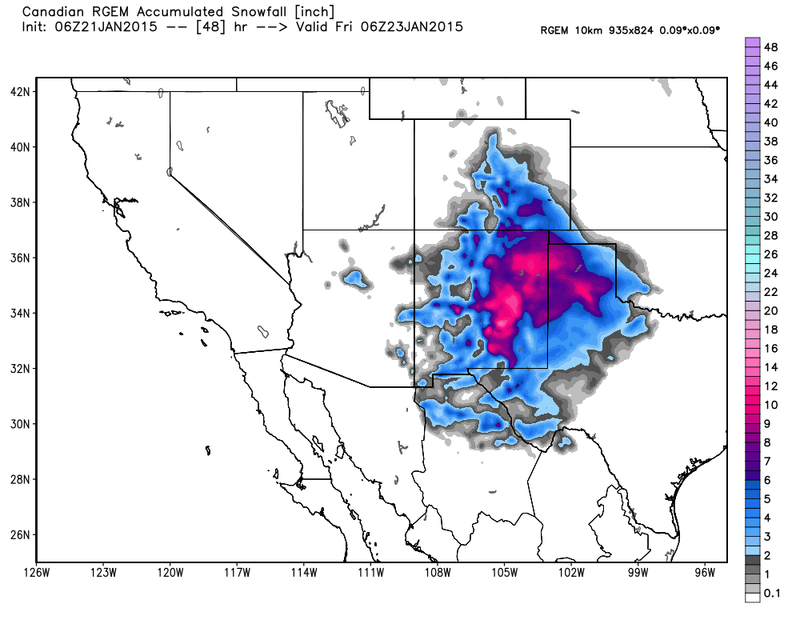 Major Winter Storm To Impact New Mexico Today Into Friday! To Heaviest Snowfall Totals & Who Gets Them. Last Nights 06Z/11 PM MST 500 MB Forecast. 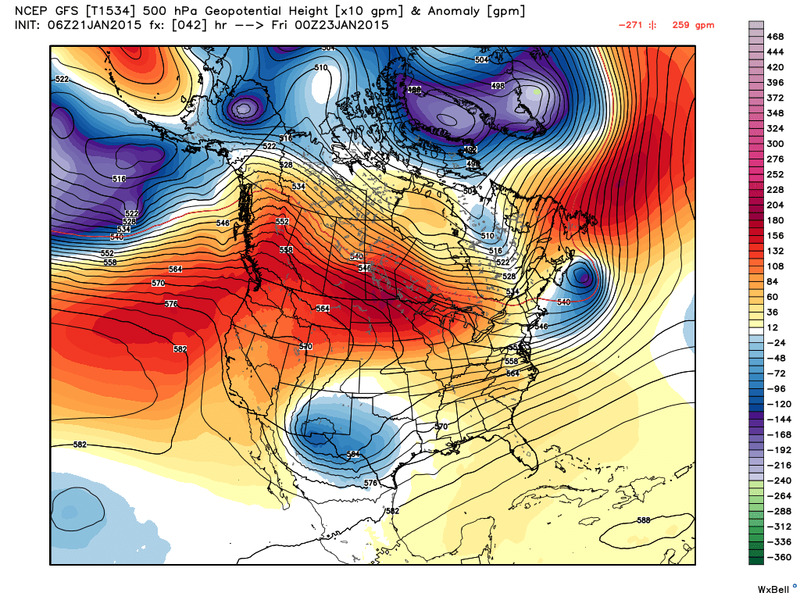 Last Nights 00Z/5PM MST ECMWF 500 MB Forecast. 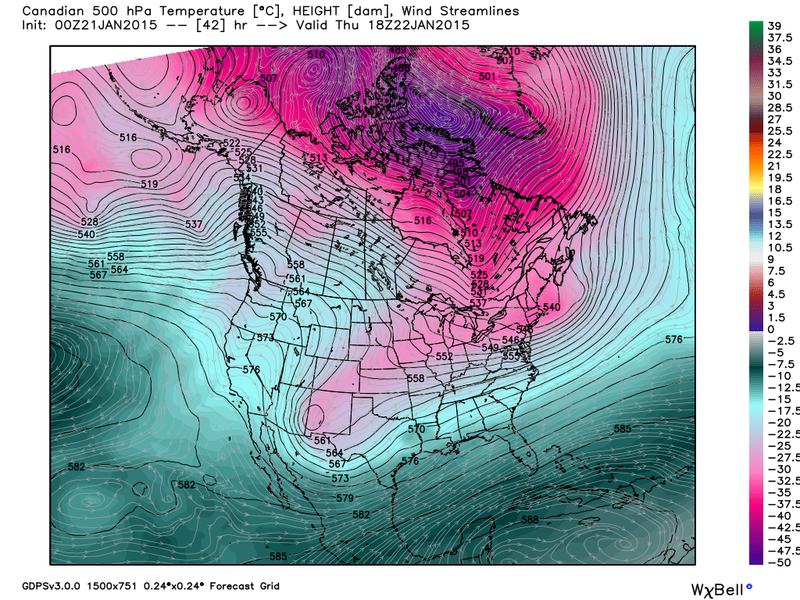 Last Nights 00Z/5PM MST Canadian (GEM) 500 MB Forecast. 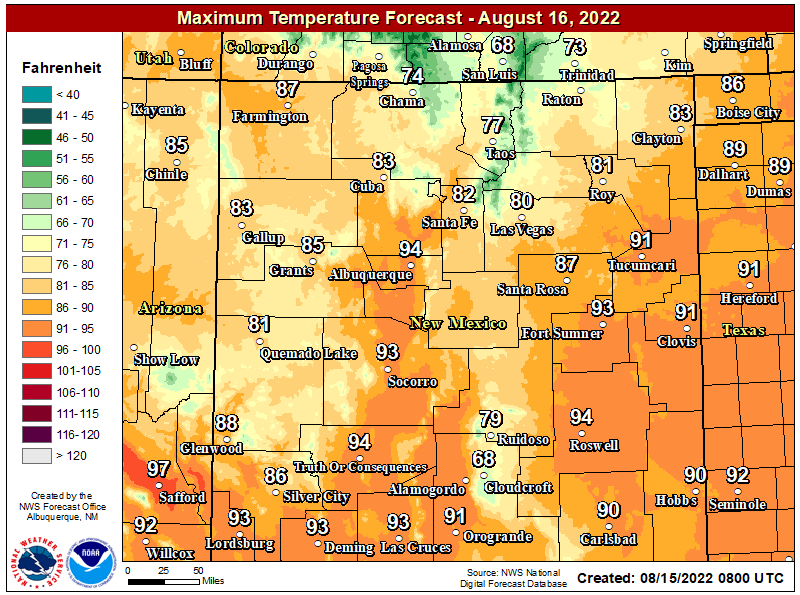 Two upper level storms are forecast to impact New Mexico's weather today into Friday morning. The first 500 millibar short wave will move southeast out of western Arizona today into southwestern New Mexico by around midnight tonight. 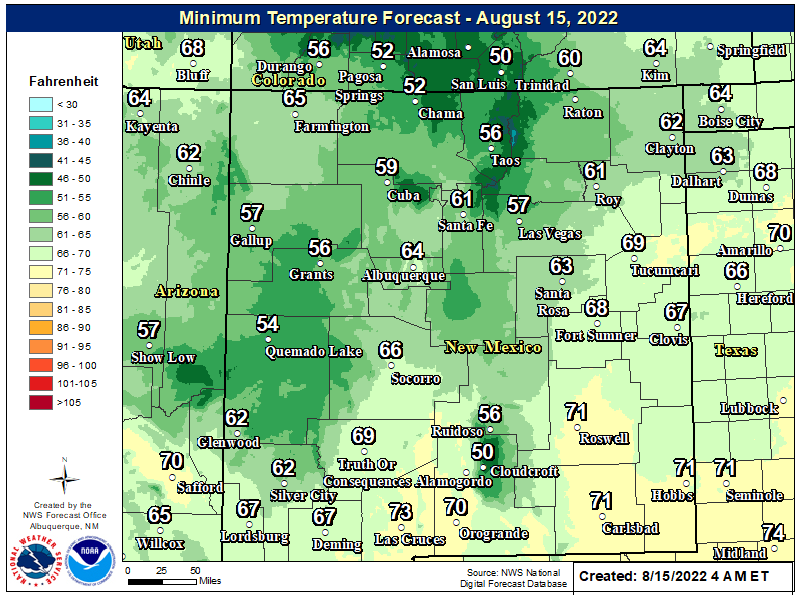 A second 500 millibar short wave will move south out of western Colorado and eastern Utah today and combine with the first short wave over western New Mexico by around sunrise tomorrow morning. A closed low is currently forecast by the GFS (1534) model to drop southeast out of western New Mexico to near El Paso by sunset tomorrow. Now that the above is clear as mud this all could change somewhat. As always the fly in the ointment will be just how far south the closed 500 millibar low tracks, if it lingers over southern New Mexico or northern Mexico, and its speed and track when it begins to pull away from the state. This will be one of the key factors in just how much snow falls in southern and southeastern New Mexico. 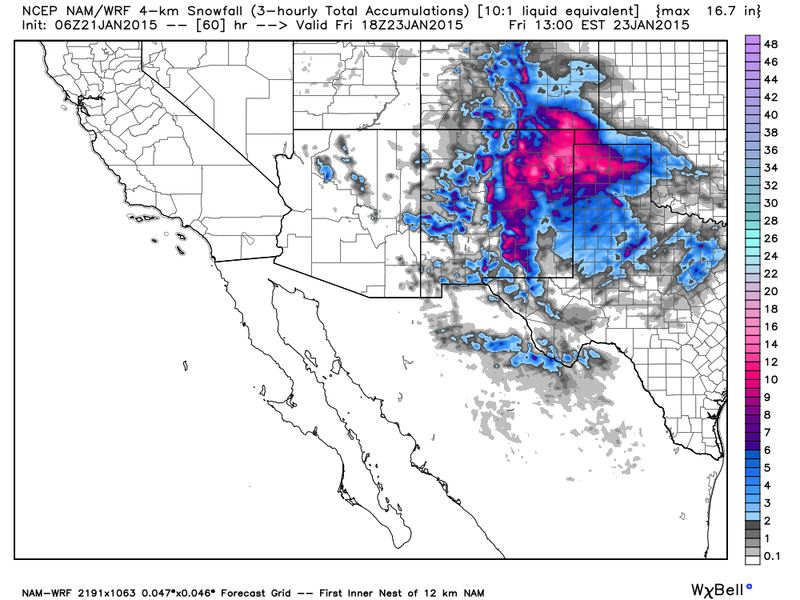 Widespread Heavy Snow Event For NM. Valid @ 11 PM MST Friday. 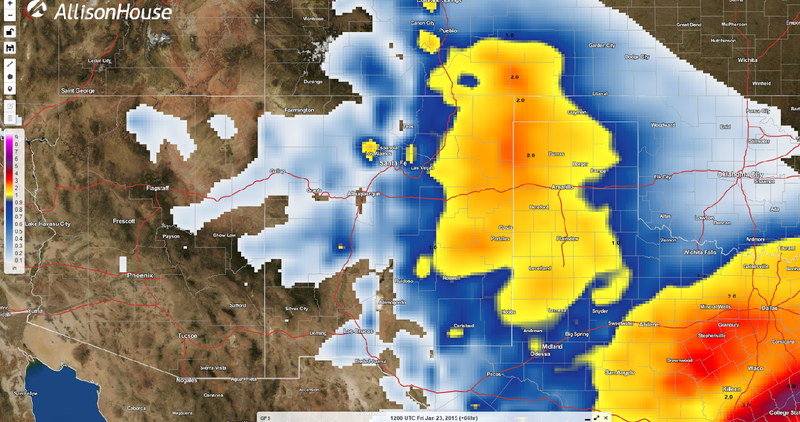 Valid @ 11 PM MST Thursday. Last Nights 06Z/11 PM MST GFS Total Precipitation Forecast. 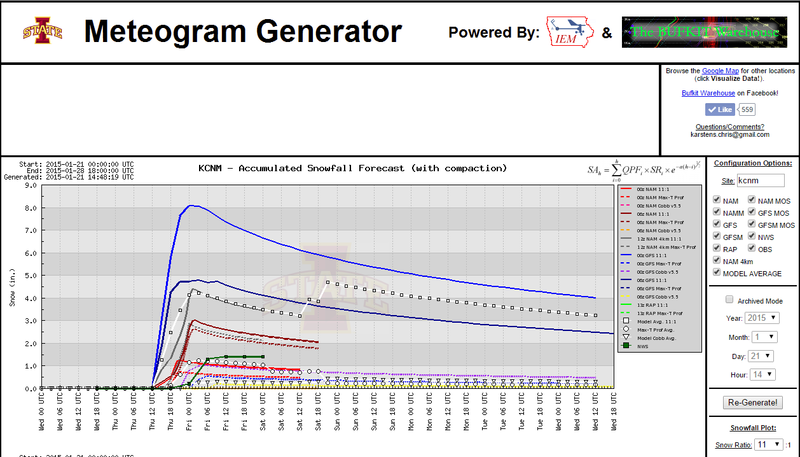 This version of the GFS model seems to be in the middle ground as far as snowfall totals go. 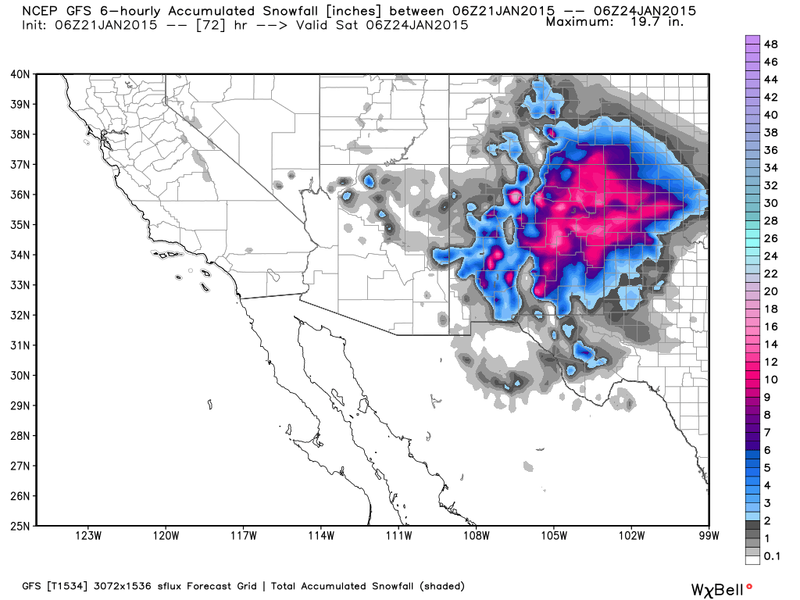 It still forecasts the heaviest snows over northeast and eastern New Mexico. 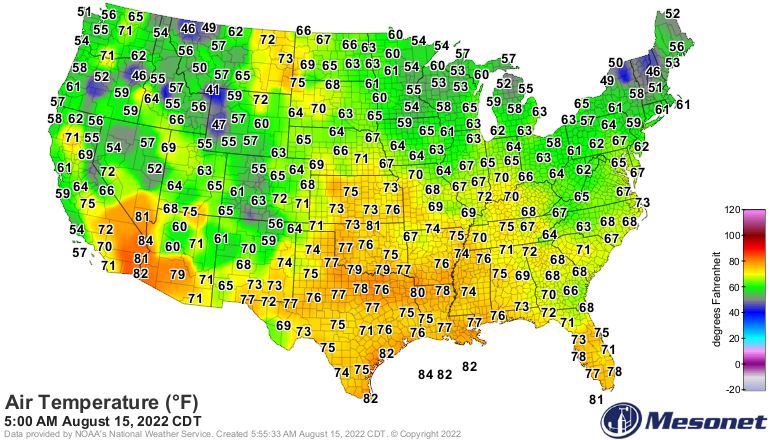 It bothers me that it doesn't have very high totals for most of the states mountains. So I think this model is under forecasting the snowfall totals from this storm. 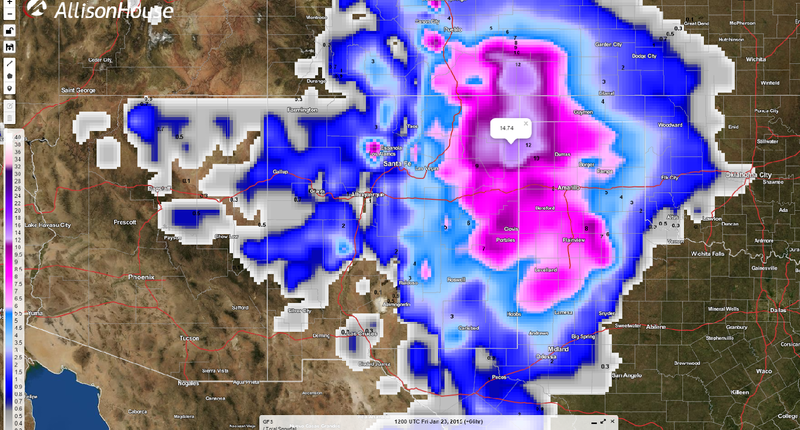 Last Nights 00Z/5 PM MST WRF-ARW Total Snowfall Forecast. Last Nights 00Z/5 PM MST WRF-ARW Total Precipitation Forecast. So after taking a look at this model you have to have had the same thought as I did,which was: Are You Kidding Me! 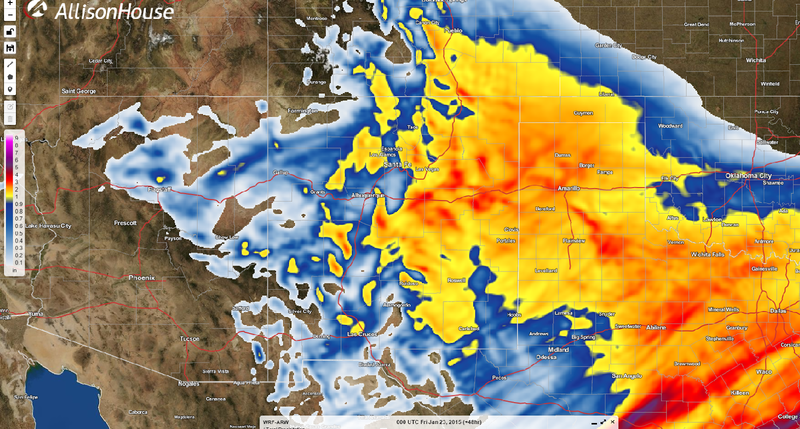 Its forecasting a foot of snow up and down the Pecos Valley from Roswell to Carlsbad, 12" - 20" along the east face of the Guadalupe and Sacramento Mountains, around 10" for Hobbs, 12" for Tatum, 12" -18" for the Clovis and Portales areas, and up around the Vaughn and Clines Corners areas 24" - 32". 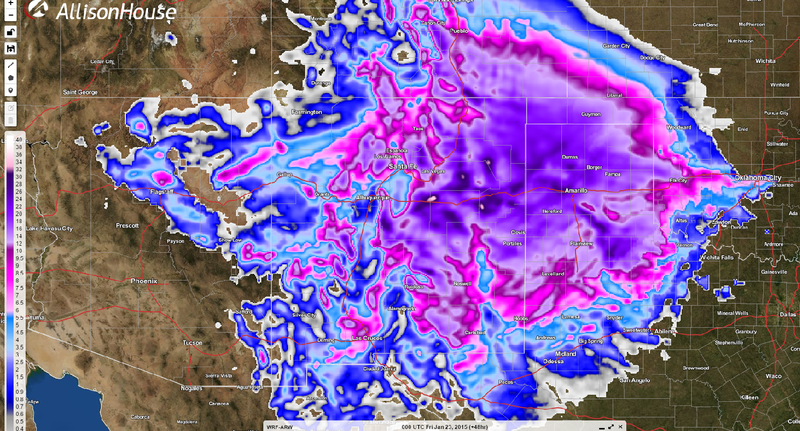 The previous run of this model had the 32" bulls eye over extreme northeastern New Mexico. Now its shifted this excessive snowfall bulls eye southwest to the Clines Corners area, and eastward along I-40. 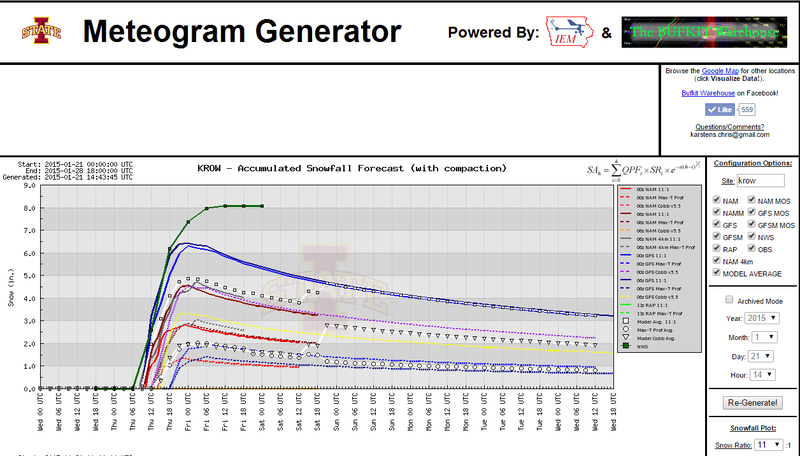 Do I believe this models forecasts? Yes and no. I like its trend of shifting the heaviest snows further south because the models are trending the upper level low further south with each new run. Do I think this much snow will fall? Its possible in some places. But honestly I can't tell you where or if 32" of snow will end up on the ground. Nor can I tell you at this time that this model is going to be dead on or way off. 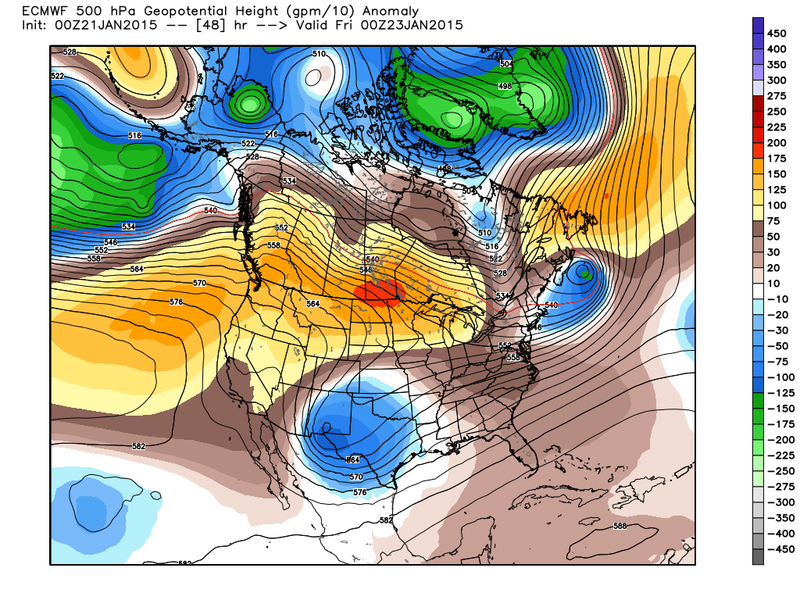 The potential for heavy to very heavy snows is there...just where is the problem. Three storms back to back December 22-25, 1997 produced snowfall totals comparable to this across the eastern one half of New Mexico. Coldest Day In SE NM History. New Mexico's ranchers suffered tremendously from this storm. Several hundred thousand cattle, sheep, and antelope died from the cold, snow, and exposure. A Dairy in Dexter lost 3,000 calves alone with many more likely having died in the Pecos Valley and not reported. The New Mexico Air National Guard dropped hay and supplies for a week trying to save these animals. Some ranchers didn't get out of their homes for a month because of the high snow drifts. Snow drifts of 3' to 6" were reported across the southeastern plains, 10' in the Guadalupe, Sacramento, and Capitan Mountains. Drifts of 10' - 30' were reported across the eastern plains. Some 3,000 people were stranded in Vaughn and had to be rescued by helicopter and snowmobiles. Do I think that this current winter storm will be this bad? No I don't think so. But make no mistake its going to be bad! So now is the time to get prepared. Click On This Link To Open Up The Latest Updated Map. 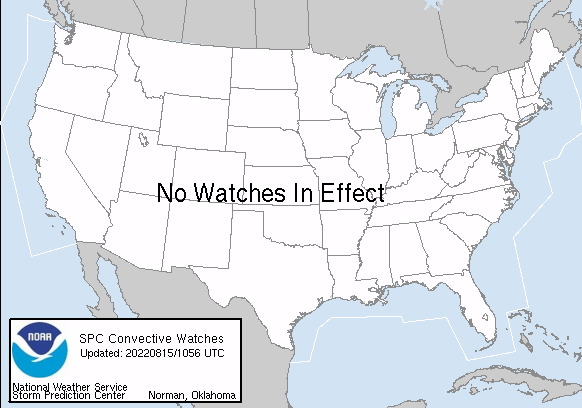 National Weather Service Watches & Warnings That Are In Effect. 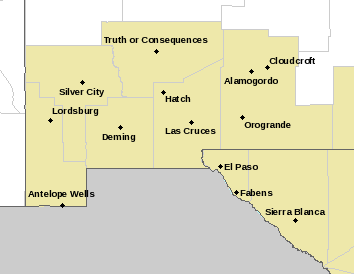 Much of New Mexico is currently (as of this writing which was at 8:00 AM MST Wednesday, January 21, 2015) under Winter Weather Advisories, Winter Storm Watches, and Winter Storm Warnings. Conditions are forecast to deteriorate today into tomorrow across the state. This will be the first widespread significant snowstorm for the state this season. This storm will turn dangerous across many areas of the state today into Friday morning. 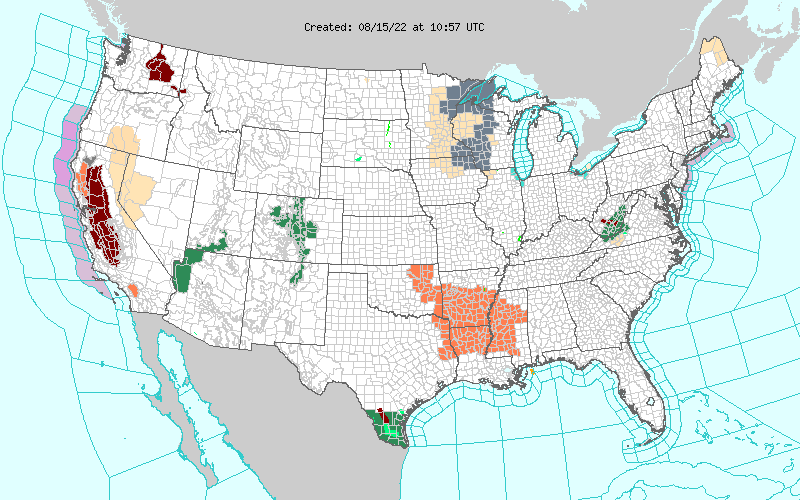 Strong emphasis is being places across the northern mountains, the northeastern, and eastern plains east of the mountains! Major impacts from this snowstorm are being forecast including significant travel problems with the possibility of many road closures. Life threatening conditions will be possible across these areas tonight into Thursday especially if you are traveling and become stranded by the heavy snowfall, blowing and drifting snow! 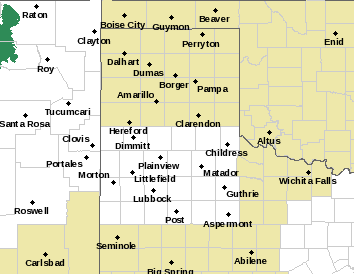 Torrance County: (Clines Corners) 6" - 10" Locally 12" - 14". Guadalupe County: (Vaughn) 6" - 10" Locally 12" - 14". Curry County: (Clovis Area) 6" - 10" Locally 12" - 14". Roosevelt County: (Portales Area) 6" - 10" Locally 12" - 14". Chaves County: 4" - 8" With Locally Higher Totals Possible. 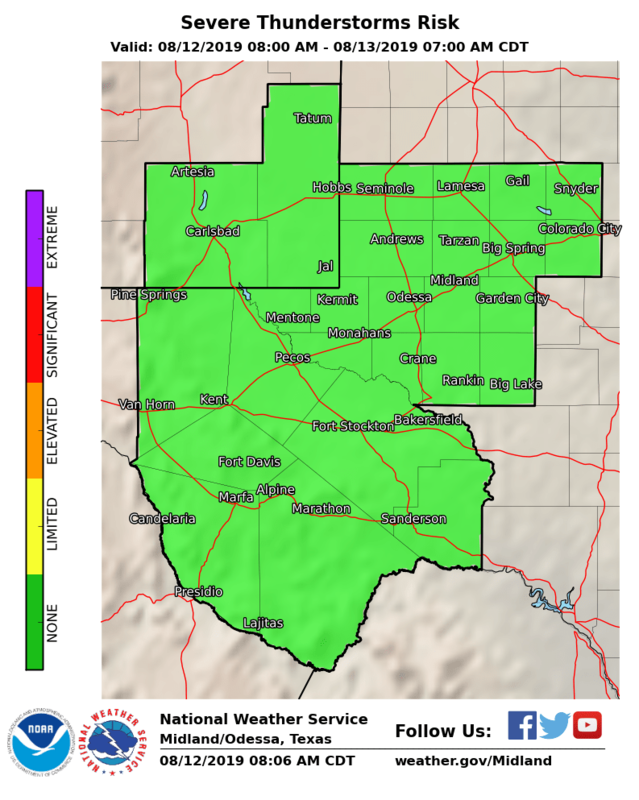 Eddy County: 2" - 6" With Locally Higher Totals Possible. Lea County: 2" - 6" With Locally Higher Totals Possible. 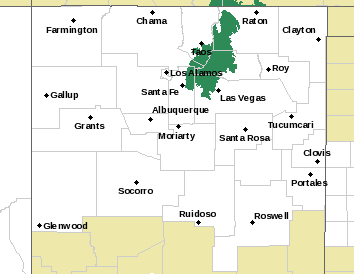 Otero County: (Cloudcroft Area) 5" - 10" With Locally Higher Totals Possible. Lincoln County: (Ruidoso Area) 4" - 8" With A Foot Over Higher Peaks. 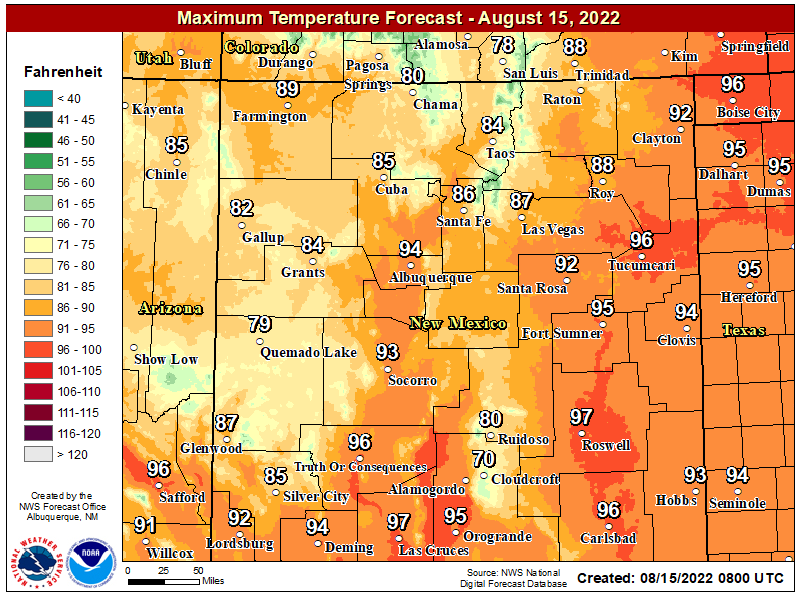 Please keep in mind that these forecasts may change as the latest computer model forecasts becomes available today. This is a potentially very dangerous winter storm folks. Its going to be a very bad idea to try and travel anywhere north of Roswell tonight into Friday morning. 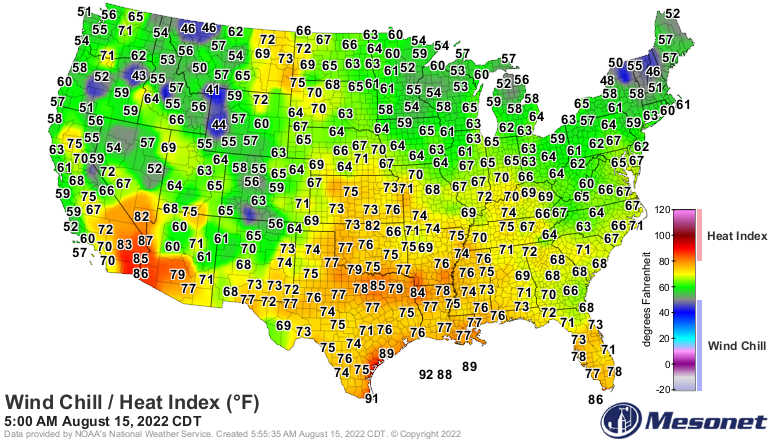 Especially across the northeastern, eastern, and east-central plains of the state. 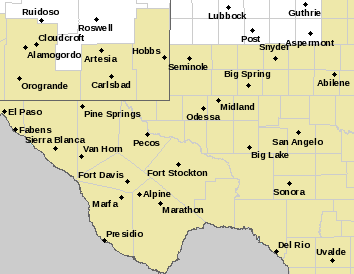 Travel will become difficult to dangerous across the Guadalupe, Sacramento, and Capitan mountains, as well as the southeastern plains tonight into Friday! I do expect to see road closures across the local area. Now is the time to prepare. 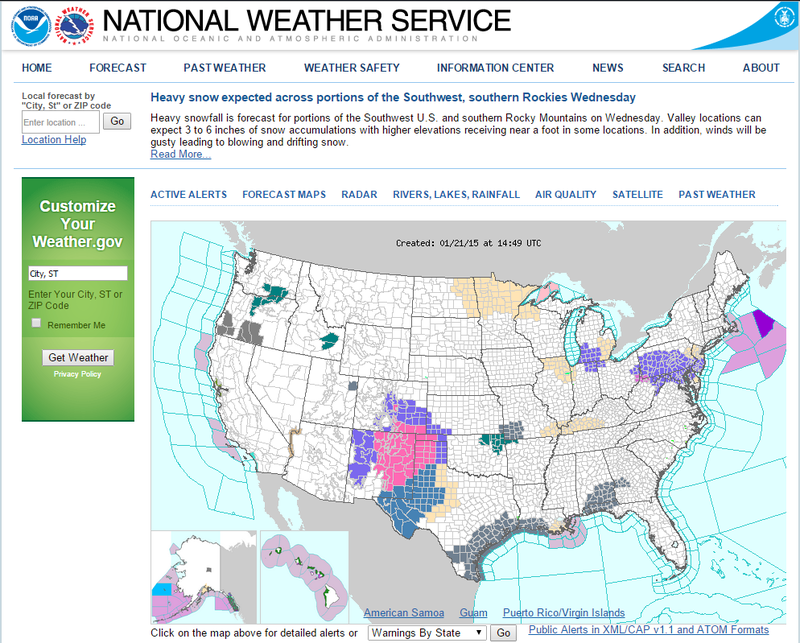 Please check my web page often, or the National Weather Service Links above for the very latest updates.